The Iraqi Security Forces (ISF) began advancing into Mosul’s eastern and southeastern neighborhoods on November 1-3, marking the first time the ISF has had any presence in the city since ISIS captured it in mid-2014. The Counter Terrorism Service (CTS) stormed Gogjali, Mosul’s easternmost suburb, on November 1 and continued clearing operations on November 2. The CTS then breached Mosul’s eastern city limits, entering al-Karama on November 2 and retaking the neighborhood of Samah on November 3. Units from the 9th Iraqi Army (IA) Division and the 1st Rapid Intervention Division recaptured several villages southeast of Mosul before entering the southeastern neighborhoods of Judaya al-Mufti on November 1 and al-Intasar on November 3. The entry into the neighborhoods marks the start of a long operation to clear ISIS’s capital in Iraq block-by-block. The ISF will face new challenges as it moves beyond ISIS’s outer defenses and into the city itself. ISIS successfully slowed the CTS advance on the eastern edge of the city, where security forces encountered IEDs, boulders obstructing roads, and snipers. ISIS militants had also set fire to oil trenches on the outskirts of the city in order to obscure targets from Coalition airstrikes and deter forces from advancing. 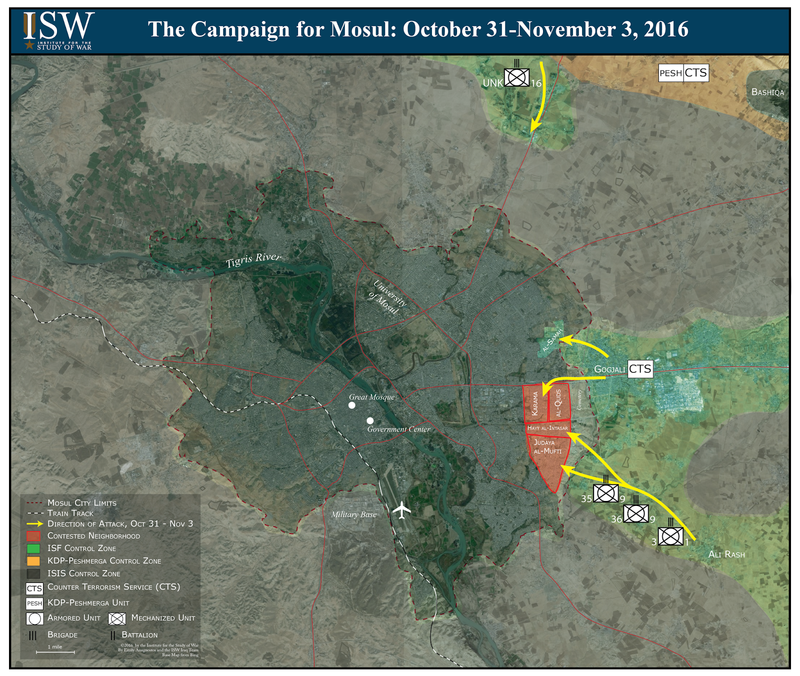 Mosul’s urban terrain will further impede advances as the security forces approach the more compact neighborhoods of Mosul’s old city and industrial sectors, and ISIS’s resistance will likely increase and intensify. The risk of civilian casualty is also high, especially among those trapped inside by ISIS to use as human shields. The Iraqi Government has already begun efforts to mitigate this risk, as the Iraqi Ministry of Defense reported that the ISF opened a safe route for civilians to escape fighting on November 3, and some have been transported in Iraqi military vehicles and buses to an Internally-Displaces Persons (IDP) camp in Khazar. Security forces have made progress recapturing terrain on Mosul’s western and southern axes. Iraqi Shi’a militias made quick gains moving northwest towards the city of Tel Afar, west of Mosul, recapturing many majority-Sunni villages along the southwestern axis from November 1-3. Iranian-backed proxy militias pushing towards Tel Afar, including the Badr Organization, Kata’ib Hezbollah and Asa’ib Ahl al-Haq (AAH), are likely to engage in sectarian violence, though they have encountered few civilians during clearing operations thus far. Meanwhile, the ISF advanced north toward Hammam al-Alil, the last major city between the security forces and Mosul on the southern axis, reaching the city’s outskirts on November 2. From Hammam al-Alil, the ISF can advance to Mosul’s southern limits, where it will likely aim to recapture an airport and military base to use as staging grounds for further operations into the city. 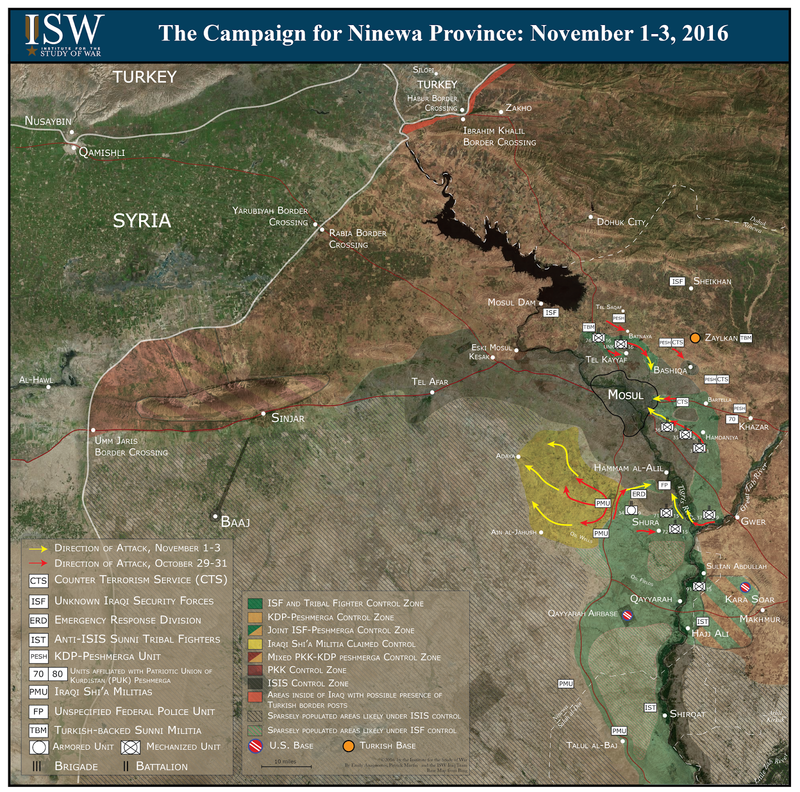 ISW now assesses that the Peshmerga has recaptured Batnaya, a Christian town north of Mosul. Sources reported control of the city as early as October 20, but no official statement was made and sources continued to report movement into the city. The current movement of forces beyond Batnaya and video of Peshmerga forces celebrating inside the city, however, suggests that Batnaya is under Peshmerga control. The recapture of Batnaya pushes Coalition control closer to Mosul’s northern limits as the ISF and Peshmerga continue operations to retake Tel Kayyaf and Bashiqa, respectively. Turkey deployed additional troops on November 2 to the Turkish town of Silopi on the Turkey-Iraq border. Turkish President Recep Erdogan’s announced the deployment on October 29, cautioning against Shi’a militia abuses against Turkmen populations in Tel Afar, west of Mosul. Other senior Turkish leaders also warned against the establishment of a Kurdistan Workers’ Party (PKK) stronghold in Sinjar and called the build-up a “precaution,” not a threat. Turkey is unlikely to engage in a major operation in Iraq, particularly as it is heavily invested in Syria. However, it is possible that Turkey deploys small units into northern Iraq in order to counter any movement by the PKK or Shi’a militias which it deems hostile. Turkey may also use its build-up as leverage in discussions regarding Mosul’s post-ISIS administration. The Iraqi Government will respond to a deployment of any size as major violation of sovereignty, escalating tensions between Iraq and Turkey and undermining the anti-ISIS Coalition.